Boston Product began with a simple idea: get smart PMs in a room and let them discuss their craft. Since our first breakfast roundtable over three years ago, our community has expanded to over 500 product professionals. People who’ve been lucky enough to score a ticket to our events have referred to them as “group therapy for PMs” and praised our ability to address the meaty topics that are most relevant to them. So when a few of us got together in the spring to discuss where to take Boston Product next, the decision was unanimous: we should put on a conference. We’re thrilled to announce Unbox, a new full-day event for frontline product managers who want to elevate their performance. 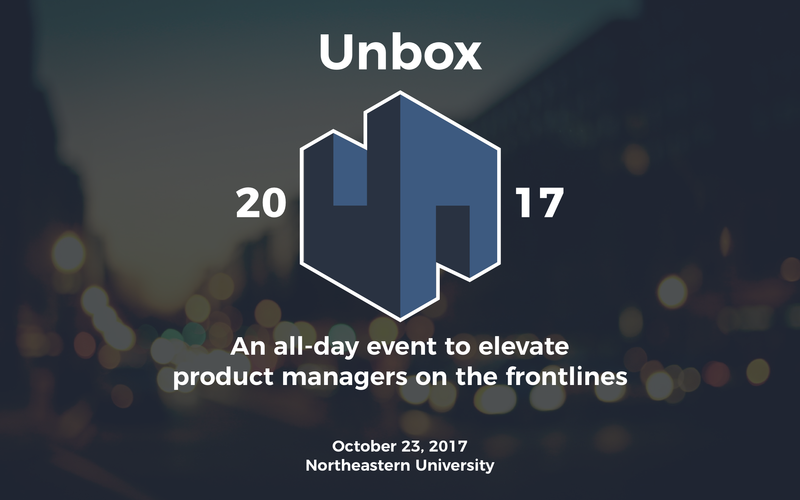 The first Unbox will be held on October 23 at Northeastern University. Product managers really value honest discussion about the challenges of our chosen careers. Hearing how other product managers have approached the problems you’re facing is one of the best ways to improve yourself on the job. Product managers here in Boston have a phenomenal diversity of backgrounds, experiences, and personalities. These facts are obvious to anyone else who’s been at a Boston Product event recently. The time has come to share the evidence with everyone else. Our goal with Unbox is to show that Boston is a city where great people build great products. As with everything we do at Boston Product, Unbox is designed to elevate product managers on the frontlines. If you’re responsible for talking to customers, analyzing metrics, and writing user stories, Unbox is for you. Our core belief is that companies succeed when their PMs do. They’re the ones making all the little decisions that end up becoming the product. They’re the ones getting held accountable for shipping on time, moving KPI needles, and keeping everyone else in the know. It can take years to unravel the effects of bad product management. However, PMs often have no formal training because none such exists. Many of them came into the role laterally or from unconventional backgrounds. At Unbox, we’re bringing together the city’s best product managers to share their experiences and learn from one another. We’ll go past the platitudes and get into the tactics—the hard skills, soft skills, and knowledge required to be an effective PM. The name Unbox refers to the myth that product is a black box, a dark art combining gut instinct and data. While these both come into play, product is ultimately about process and predictability. We want to help PMs achieve repeatable success at work. Unbox is an event by and for the product talent in the Boston area. Within a mile on either side of the Charles River, we’re working at companies building the future of healthcare, education, fintech, gaming, travel, robotics, and more. We’re setting new standards at established leaders in B2B SaaS, e-commerce, and biotechnology. These are your peers, and this is who you’ll learn from at Unbox. Tickets are available now for $125. We think you should feel comfortable asking your manager to reimburse you for this, because you will leave Unbox inspired and equipped to be a better product manager the next day. When you succeed, your company does too. Be sure to check out the Unbox site for all the latest event information. We can’t wait to see everyone on October 23! The collective insights of over 500 product professionals working to elevate our careers and show that Boston is where great people build great products.